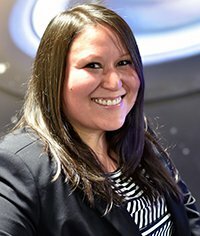 February 16, 2018 – Bernadette Maisel, Space Foundation Director – Program Initiatives, has been selected by the Colorado Springs Business Journal (CSBJ) to receive a Rising Stars Award, the city’s most prestigious award for professionals under the age of 40. To be selected, each candidate was reviewed by a selection committee on five criteria — career history, business affiliations, community involvement, professional and personal accomplishments and other awards and education. As a recipient, Maisel will be interviewed for a feature article in the CSBJ and will be honored at a ceremony on March 29. In her nearly 10 years at the Space Foundation, Maisel has contributed to the success of a number of areas including establishing visitor welcome procedures at the Space Foundation Discovery Center, managing customer relations protocol for the annual Space Symposium, managing retail sales and data management and supporting senior leadership. In her current role, she manages a wide range of Space Foundation activities, including program content for major events, the prestigious space awards program, customer engagement with international delegations and VIP guests at the Space Symposium. Maisel also oversees the execution of the Space Foundation’s New Generation program, providing career guidance and mentoring for space professionals age 35 and younger. She is an active member of the Colorado Springs Rising Professionals organization, where she served as the Vice Chair of the Professional Development Committee, working to educate and promote professional development with young business professionals in the Pikes Peak region. Maisel holds a Bachelor of Arts degree in English from the University of Colorado at Colorado Springs.